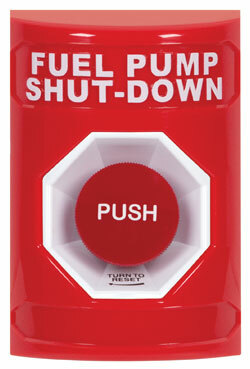 This North American style, ADA Compliant, multipurpose push button switch is designed to compliment fire alarm systems. It incorporates a unique, patented design that helps dramatically to stop accidental activation. You have the choice of wording and language. Because of the superior, patented design combined with quality construction, you can expect outstanding performance for years to come. Customers are surprised to find all this quality is available at no increase in price. Stainless steel backplate with ground lug. Station housing molded of super tough polycarbonate. ADA Compliant and UL Listed to U.S. and Canadian safety standards for indoor and outdoor use. When used outdoors, UL requires unit to be protected with STI Mini Weather Stopper. Holds up to three sets of isolated contacts either NO or NC. Standard switch includes one NO and one NC.